MoJo Monday: Give Thanks! | Jodilightful! In honor of Thanksgiving week, I’m considering today how an attitude of thankfulness helps me to love my life and find joy in mothering! 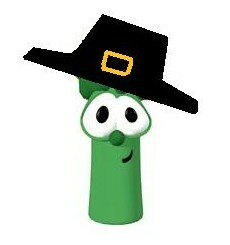 In the immortal words of Junior Asparagus, “A thankful heart is a happy heart.” How can something simple enough for a singing vegetable to communicate effectively to preschoolers be such a tough thing to put into practice? I don’t think it’s just because it’s Thanksgiving time that this verse has been on my heart lately. You know how it is when there’s something God really wants to to get through your thick skull, so He seems to bring it up in every single sermon, Bible study, and indeed, children’s video that crosses your path? It’s been like that. Most recently, it came up yesterday in the marriage video series by Paul Tripp we’ve been watching in Sunday school. Each day, he said, (and I’m totally paraphrasing here) when we wake up to our flawed spouse and our messy, dysfunctional (that word was his!) children, we should feel so overwhelmed that God loves *us*, that our love cannot help but overflow to them. Do you get it? *I* am flawed, and messy, and dysfunctional, and not only does God love me enough to bless me with a precious family who loves me, He loved me enough to die for me. To die instead of me. To invite messy-flawed-dysfunctional me into His family. When that fact sinks in a little, it changes everything. When we begin to realize what we really deserved, the Holy Spirit can open our eyes to what God has instead richly, richly blessed us with. Life, and love and a relationship with Himself that is untainted by sin thanks to Christ’s incredible sacrifice. Amazing! With all that in mind, I want to take a minute to give thanks here for each of the precious girls God has blessed our family with. They are messy, and sometimes even a little dysfunctional, but each one is a blessing beyond measure. Pippa Violet, big sister extraordinaire. I am thankful for your sparkly eyes and your pensive spirit. I love that you are learning to be gracious and self-controlled in the way you speak to others. You are becoming a young lady, and it is a joy to watch! 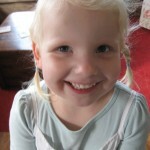 Romilly Alice, our RAY of sunshine. 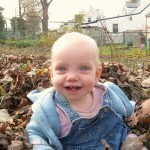 I am thankful for your smile that lights up the whole room, for your love of your sisters, for your helpfulness. I love that we never know what you are going to say, but that you never cease to totally surprise us and make us laugh. 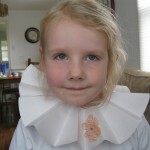 Beatrix Joanna, crazy chatterbox. 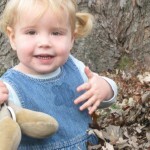 I am thankful for your sweet face and your hilarious running commentary on life. I love that you know your mind, but are learning to express it without stubbornness. You are loud and fun and full of life. Your sense of adventure inspires us all. Juniper Lucy, little bright eyes. Well. There’s just not much to *not* be thankful about yet! I am thankful for your easy-going, content-with-life demeanor. I love your big, toothy, giant-eyed, dimply grin that you are so quick to flash at anyone who glances your way. What a blessing you are to our family! Thank you, God, for the incredible blessings you have filled my life with! May I not be quick to forget how unmerited they are. You must be doing a much more fabulous job of raising your kids than I am doing with mine. Or … maybe your post is making me think that I’m a glass half empty girl when I mean to be a glass half full girl. Lindsay, those are *awesome* things 🙂 (In fact I wish Pippa were more motivated on the reading front… alas, she’ll get there.) And the operative word in mine was “learning”. For the kids *and* for Mommy! We are *very much* works in progress, so thankful for grace along the way!